3 for Intelligence: Puppets war: filling your necron holes with shiny bits! Puppets war: filling your necron holes with shiny bits! As GW languishes on their rears, 3rd party companies are picking up where they dropped the buck. The latest instance of this is the newest "Cyber" releases from Puppets war! A lot of new Necron players are lamenting the lack of some crucial pieces to their competitive lists. 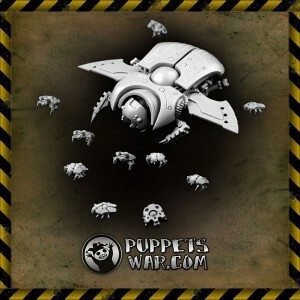 Spyders and Wraiths are just two of those, but Puppets war has stepped up to fill the need. Check out the "Cyber Gigant Beetle"
"Set contains one main body, 2 armors, 2 blades, 6 leg mountings, 6 legs, head, 2 smaller face blades, 2 bigger face blades, and 10 cyber beetles. Designed to fit 28mm tabletop wargames scale. Supplied unassembled and unpainted." It retails for a little over $28, which may seem like a lot for one model, but keep in mind you get 10 "cyber beetles" as well. Also, if you check out the site, these have multiple poses that you can use to distinguish the up to 9 that you can field. Next up, is the "Cyber Arthropod squad"
"Set contains 3 Cyber Arthropods. Designed to fit 28mm tabletop wargames scale, supplied unassembled and unpainted." These bad boys are quite a deal compared to the current cost of getting a hold of the older ones. At $25 for a squad of 3, you are saving yourself about $20 off the ebay price. They also come with CC options that include the whip or the scissorhand as shown in the pic above. I have not personally ordered from these guys, but their reputation preceeds them. Their models are cast well and the designs are cool. (In my opinion at least!) The only potential downside is that these guys are based out of poland so shipping is generally long and customer service can be an issue since they are in a far different time zone. My order of cyber beetles took two weeks to arrive in the States. The legs are a bit thin and will break off. Guess that's why GW's version doesn't have legs but nubs where the legs would attach. The plan is to have one GW model, one of each of the two beetle models per base. Maganitize the bottom of the bugs and remove them one by one per wound. Still have one 'official' GW bug per base for anyone complaining about non GW models. That sounds about right as far as the shipping goes. They are coming from poland. Does it come with a flying base tyoe attachment like the older ones at all? That would be interesting to know. No hate here. We play by the rule of cool and these things are definitely cool. That's definitely a cool modelling idea. I dig it! We were just talking about that in real life. Do the "It must be 50% GW models" rule still apply now that GW no longer supports tournamnets? I would say no, considering there is no support, therefore they have no say what so ever. Our FLGS doesn't ever hold anyone to that rule anyways.